Jake Higginbottom might be young in years compared to the seasoned professionals competing at the NSW PGA Championships in Wollongong this week, yet that did not stop the 18-year-old firing 8-under-par 62 for a share of the lead with Andre Stolz and Martin Dive. Higginbottom’s opening round was flawless around the wind swept links layout as he positioned himself nicely against many named tour journeymen, some of whom were playing the game when Higginbottom was still in nappies. “My putting was the key out there today and I drove the ball well,” said Higginbotom, 33rd in the world amateur rankings. Winning back to back at the 2011 Queensland Amateur and Keperra Bowl, emerged as one of our top amateur talents, alongside with the likes of Matt Stieger, Brett Drewitt and Cameron Smith. It sets the stage for an intriguing tournament with the youth of Higginbottom pitched against multiple tour winners like Andre Stolz, who has won on nearly every main world tour and Kurt Barnes, who fired an opening 7-under-par round to be one stroke behind the leaders. Stolz is accustomed to leading professional events with nine career victories including two this year in Asia and one on the PGA Tour in 2004. In mid-2005, Stolz had returned to Australia from the riches of the PGA Tour despite having playing privileges until the end of 2006. A wrist injury had convinced Stolz to take a rest from the game and the pressures of having a young family on Tour had all taken their toll. Stolz and his wife Cathy had focused on running a small business on the NSW Central Coast, and the only ball Stolz was hitting was a cricket ball in the local grad competition. Since Stolz, 41, has re-emerged as a driving force this season on the OneAsia Tour winning the Thailand Open to add to his Indonesia PGA Championship to be currently leading the OneAsia money list with USD$ 449,074. Lately, Stolz has found the a perfect mix of both family, business and pleasure with playing the OneAsia Tour. 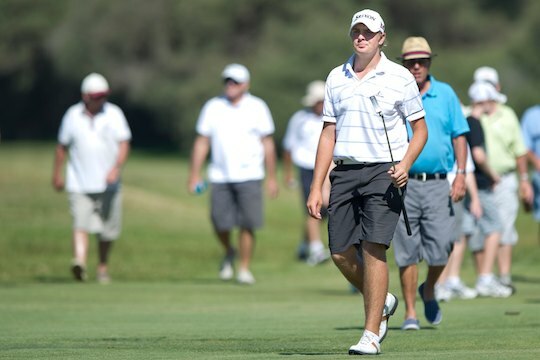 Stolz’s son, Zac, 15, is emerging as a promising amateur talent and has followed his dad to play in a number of professionals events recently. Zac opened in Wollongong with a 2-over-par 72, a stroke behind defending champion, Steven Bowditch, who fired a 1-over-par 71 to be in a tie for 96th position. With the tournament reduced to three rounds following inclement weather cancelling Thursday’s opening round, Bowditch needs a low second round to make the top-50 plus ties cut mark following Saturday’s second round. Also in contention at 7-under are Rohan Blizard, last week’s winner at the Western Australian PGA championship and Peter Wilson. A further shot back at 6-under are Andrew Evans, Brendan Smith, Craig Hancock, Josh Younger, James McLean and Neil Sarkies. Another amateur showing up the professionals during the first round was Queensland’s Tim Hart, who was paired with Higginbottom. Hart fired a 5-under-par round of 65 to be in a tie for 13th position along with New Zealander’s Steve Alker and Doug Holloway and Aussies Nicholas Cullen and Matthew Miller.